Data recovery is almost every computer/laptop user’s problem . Data recovery softwares is a most searched keyword in all search engines . Especially frequently multimedia mobile phone users get affected this problem . It would be not wrong to say that It happens commonly in multimedia mobile phone’s memory card and often your data get lost . If you are a regular reader of I Hate Cracks then you know well that I have shared many top quality and world’s best data recovery softwares gifts from their companies . Especially Wondershare data recovery which is my favorite one and I have tried it many times and every I achieved that I wanted . And the good news is that this offer is still available to grab a free license key to activate its full version . There is a another kind of data losing , frequently your computer/laptop gets corrupted , And sometime a blue color screen appears . It might happen at anytime and you got to reinstall Windows and as well as , after installing Windows all needed programs and settings . But don’t worry , by now , today’s software will solve this problem gracefully without any time wasting . Today’s gift is SysRestore Pro worth 29.99$ per license key for 1 computer/laptop and this gift from Sysnew.com . Basically Sysrestore is not a traditional data recovery software , It is a system and disk clone software and makes images on your system and data for recovery if anything goes wrong . Sysrestore allows us to easily restore our system partitions and even a whole hard drive to a previously saved state , In other words , We can reverse our Windows to its early healthy and error free state . SysRestore creates snapshots different status of your computer/laptop and as well Server for backup and With the help of backup snapshots, you can return system and hard disk to any desired healthy status . Viruses and other security threats are a major reason for facing this problem . SysRestore keeps away all these security threats from your beloved computer/laptop that creates problems for your Windows health and performance . When you install it on your computer/laptop , It would disable ” Windows restore point ” and all other that kind of softwares . Sysnew.com offers freeware and pro version , Freeware version creates only 10 snapshots but pro version can create 1000 snapshots . But you have a big chance to grab a license key to activate its pro version for free till 31 July 2013 . 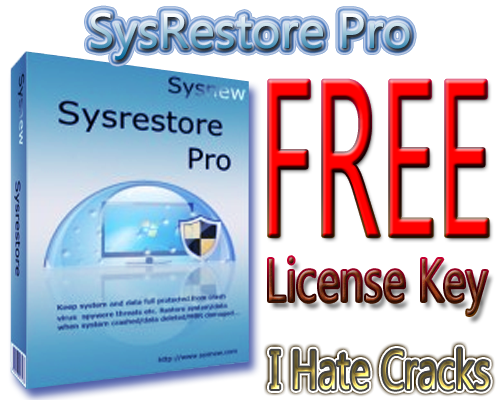 Download SysRestore Pro version from here and install . After installation visit this page to get a license key to activate it .